We are no longer issuing printed versions of the Khaldea Astrological Calendar. Introducing the 2004 KHALDEA Astrological Calendar! The 2004 Khaldea Astrological Calendar is an exquisite fusion of art, symbolism and digital technology. The Khaldea 2004 Astrology Calendar beautifully presents the essential tools and knowledge you need to start using astrology as an effective time-management tool with a soul. Each monthly 8 1/2" x 14" vertical spread of the Khaldea Astrological Calendar features a high-precision astrological ephemeris and a calendar grid incorporating precisely timed astrological aspects and other astro-data, as well as a striking abstract image and an accessible and inspiring description of the month's zodiacal sign. The unique display of daily lunar phases which unfolds across the calendar face makes it easy to follow the Lunation Cycle from day-to-day and to place Lunation Planning into fruitful practice. The Khaldea 2004 Astrology Calendar includes a comprehensive article on how to use Lunation Planning, as well as explanatory text by Michael R. Meyer on the Planets in Astrology, the Astrological Aspects, and the Signs of the Zodiac. The Khaldea 2004 Astrology Calendar is the only astrological calendar available in printed editions for 16 time zones worldwide! All editions of the 18-page, 8 1/2" x 14" (216mm x 356mm) calendar are currently available for only $14.95, with FREE SHIPPING to USA destinations ($4.00 air mail shipping and handling elsewhere). Free Shipping offer is for a limited time only, so order yours today! New! The pocket-size Khaldea 2004 CompanionAstrologerTM in editions for 16 Time Zones Worldwide. This 4.25" x 5.5" (113mm x 139mm), 28-page gem is a smaller version of our full-size wall calendar. It consist of exact reductions of the monthly spreads found in the larger version of the KhaldeaCalendarTM, along with condensed versions of the text on the Planets, Aspects and Signs. Order yours today for only $6.95 and, for a limited time, receive free shipping to USA destinations ($2.00 elsewhere). You probably always wished there was a pocket-size astrological calendar for your time zone. Now here it is! Order yours now! For a limited time, save even more when you purchase the Khaldea 2004 CompanionAstrologerTM along with the full-size wall calendar. A $21.90 value for only $19.95 - with free shipping to USA addresses ($5.00 shipping elsewhere). Don't miss out on this special, limited time offer, order yours now! The Khaldea 2004 Astrology Calendar makes it easy to benefit from Lunation Planning � a natural, organic time-management system based on the 29.5-day Lunation Cycle, the ever-changing cyclic relationship between the Sun and the Moon. Everyone, in their own way, naturally feels and performs better when they are attuned with its rhythm. When guided by this natural cycle, our projects and endeavors � be they long-term or short-term, acted out by an individual or by a group � are more successful and rewarding. Lunation Planning is the world's oldest time-management tool. Lunation Planning is universal, it is deeply rooted in all cultures and religions. It is the foundation of virtually all ancient calendars, including the Hebrew, Islamic and the Chinese calendars. The ultra-accurate, digitally printed 2004 edition of the Khaldea Astrological Calendar is the first printed version to be offered to the public. In addition to a calendar grid familiar to users of the online version of the calendar, each month's spread includes everything one expects from an astrological calendar � including the ultra-accurate KhaldeaEphemerisTM, an accessible and inspiring description of the month's zodiacal sign, and abstract art representing the month's zodiacal sign. The planetary positions and timed data incorporated into the KhaldeaCalendarTM are generated by the KhaldeaEphemerisTM Version 7 � proprietary software which computes planetary positions in full agreement with the Astronomical Almanac. The KhaldeaEphemerisTM Version 7 uses JPL DE405/406 fundamental data. Reduction to apparent positions is performed in strict accordance with the Astronomical Almanac and the Explanatory Supplement to the Astronomical Almanac. The KhaldeaEphemerisTM Version 7 has an accuracy greater than +/- 0.0001" arcsecond for the Sun, Moon and solar system planets over a span of 6,000 years. In developing Version 7 of the KhaldeaEphemerisTM, great attention has been taken to assure the highest possible accuracy. In making the Khaldea 2004 Astrological Calendar, meticulous care was taken to assure the highest possible accuracy for astrological aspects and other timed data. It takes more than the world's most accurate ephemeris to generate an aspectarian of the highest possible accuracy. In making the 2004 Astrological Calendar the methods used by the KhaldeaEphemerisTM to determine timed data were improved over previous versions of the ephemeris. The result is that for all but about 4-7 aspects annually, timed data has an accuracy of +/- 2 seconds! 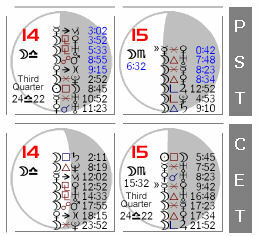 Order the 2004 Khaldea Astrology Calendar for your time zone today. In the Zodiacal Abstract Series - the New Signs of the Year � the artist attempts to give image to the 12 primordial patterns of energy and dynamic processes which constitutes the universal matrix known as the zodiac. "In this series of Abstraction," Michael R. Meyer states, "layers of animism, vitalism, totemism, geometric contrivance and personification are striped away in an attempt to represent the pure essence of zodiacal energies. The zoological types are not the real zodiacal energies, but merely convenient totems ancient people used to encapsulate what they could understand of primordial zodiacal energies. They had to use totems because they couldn�t understand or work directly with the real energies condensed in the universal matrix of the zodiac. Today, in our post-quantum era, we need to attempt to tune into the core zodiacal energies, energies free of zoological characterizations and personifications." The Zodiacal Abstracts are a pure representation of Modern Art, especially of the geometric abstraction which grew out of the quantum revolution of the late-nineteenth and early-twentieth centuries, a revolution of mind and spirit which encouraged artists such as Kandinsky and others to work with pure energy forms. "Considering the popularity of astrology among artists," Michael observes, "it�s interesting abstract geometric zodiacal images have not been attempted previously." The KhaldeaCalendarTM is designed and developed, and with text and art, by Michael R. Meyer. 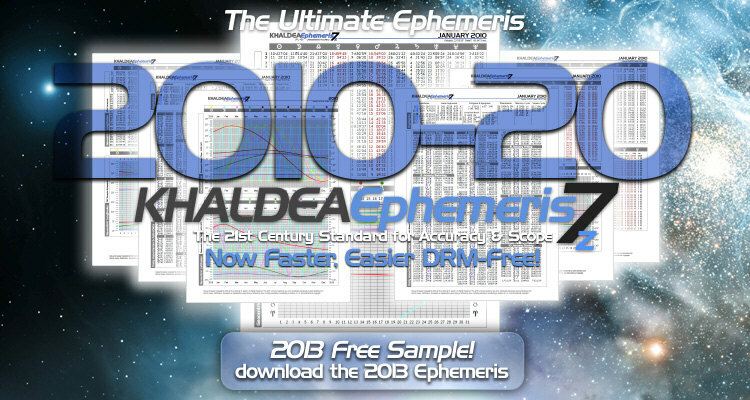 The KhaldeaEphemerisTM is designed, developed and programmed by Michael R. Meyer. are a trademarks of Michael R. Meyer. are copyright © 2000-2003 by Michael R. Meyer. All Rights Reserved.